Well, it looks like I was wrong again in guessing who won the debate. Out of the three debates, I thought that last night went against Barack worse than the others, which is why I was pleasantly surprised to see that the polls seem to think it was his best debate by far. That's why no one's paying me to do this, I guess. At times McCain took lying to new heights: (Ayers, ACORN, his ads), but at times I was amazed by his honesty. He actually defended lowering taxes for the rich, showed complete indifference about the murders of union leaders, ridiculed the exemption for the life of the mother, strongly defended the crowds at his rallies. He went for the vote of the hard right. It was pretty shocking to watch, but almost refreshing in a strange way. The public doesn't usually get to hear the uncensored beliefs of the conservative movement, so that might have something to do with how much Obama crushed the debate. Playing to the base is smart electoral strategy, and it won Bush 2 terms. But the fundamental numbers in those elections were somewhat close, and this time around we could be running Hillary Clinton a friendly looking cardboard cutout and still pull it off. As for our Barack, I thought his performance was a mixed bag. His high point by far was condemning McCain's rallies, and it's only my hope that a few curious people looked up those youtubes after hearing Obama bring it up. It wasn't "a few" people, it was a mob atmosphere, and the more those videos are seen the better. Also, when talking about the economy, Obama's rhetoric is still cautious, but is more effective than it used to be. Bringing up how the Wall Street Bailout was a first step was a good way of leading into a middle class bailout, which puts him in a stark contrast with McCain. He did a good job of simply restating his policies when McCain started to strongly defend conservative economics without being prompted. One thing I truly don't understand about him, is that this man once had extremely progressive stands on quite a few issues. Maybe a more die-hard Obama backer than myself can explain this, but I just don't see the need throw progressive policies under the bus while advocating your own. Like I said last night, I know that Obama has been told that he needs to move to the "center" to win, but why attack the more progressive ideas in the process? We know why McCain does that: Conservative ideas are unpopular! But progressive ideas on health care, trade, energy, foreign policy and the economy ARE popular! This goes back to the argument last night over who could piss off their party more. McCain makes that argument because the approval ratings for his party are in the teens. Why Obama goes out of his way to prove how much he can disagree with a popular political party is beyond me. Also, I'd like these debates to be canonized as a case study for future democrats, when they think they need to "move to the center" in order to win elections. -Remember when the Democrats caved on FISA so that the issue was "off the table"? -Remember when the Democrats refused to play hardball on the Iraq war because they would be seen as "not supporting the troops"? -Remember when the Democrats changed their position on drilling so that the couldn't be attacked on the issue? Obama went along with all three of those caves to solely better his chances in moments just like this. In the first debate McCain hammered him for opposing the FISA bill, in the second debate he and Palin attacked him for not funding the troops and in the third debate he was ridiculed for not supporting drilling. There have also been countless stump speeches and adds attacking him on all three. A message to all Democrats: The Republicans don't care that you caved, and they'll call you a dirty commie liberal no matter how you vote. So since they'll attack you anyway, you might as well stop being cowards and stand up for the positions that you supposedly believe in. Will they learn this lesson? I doubt it, and in fact I'd say it's more likely that the opposite happens than that more candidates run decrying partisanship and running to the center because of its supposed success in this race. Obama has run a smart campaign, and has the best ground game in the history of modern elections, but implying that he's winning the election by shifting to the center is as big of a causation/correlation fallacy as you can get. 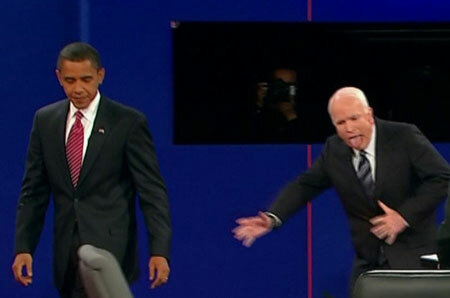 Obama's campaign vs John McCain has had the luxury of running a prevent defense for 4 quarters. It isn't a bad campaign strategy for Obama in this unique situation, in fact it's a smart one. But in the future I doubt any candidate will have all the voting trends this overwhelmingly in their favor ever again, which combined with Obama's phenomenal ground game is a sort of perfect storm. There's a little less than 3 weeks till the election. Volunteer if you can, it isn't over yet. But looking at how the winds are blowing, we can help make this thing a landslide with a mandate. You know, a real one. Nice post. The reason that Obama can't be as progressive as some might want him to be on the national stage, is that he still relies on attracting the moderate and independent voter. He knows that his parties base will vote for him. He needs to attract the undecided voter who is truly in the center of the spectrum. I have read a lot of conservative papers and postings, and their biggest attack is that Obama is a radical liberal. People read that, and despite not really knowing what that means, it truly scares them. Obama doesn't want to be a "radical" (read, progressive) to Joe Plumber. He needs to show that he can understand the plight of the average, middle of the road, Joe Six Pack. He's trying to woo the Fairfax crowd, not the Takoma Parkers. @jsabalbaro, I think you're right that the target of these messages is the brand of independent voter that's susceptible (but not necessarily swayed) by conservative rhetoric about Obama's liberalism. Historically, they're a huge weight on democratic candidates, and help explain the success of his debate performances: "wait a minute, he actually seems like a nice guy, and he says somethings I agree with..."
That said, what bothers me even more than the rightward shift is the shift towards totally irrational policies. Belief in clean coal, for example, is pathological. It makes no sense, except as an excuse to continue mining and burning coal unfettered by anything but the promise of making it cleaner at some point. In no other respect can coal be considered a possible energy source in the future, and my worry is that Obama's support for things like this will eventually come across as equally insane – at best, triangulation and ingenuine politics. The country wants and needs an intelligent leader right now, both for the election and in office. Regardless of what it looks like, Obama is not being one in some important respects. I just wanted to add I don't think some of Obama's rhetoric is too useful in courting the Joe the plumbers of the world. It's long been a worry of mine that Obama believes that this country is more inherently conservative than it actually is. If you base this statement on a few social issues, then maybe, but if you base it how people feel about policy issues (Foreign policy, the economy, trade, health care), then the polls don't seem to back it up. I buy the argument if Obama is trying to please the press, since they have created this mythical conception of the center that is nowhere near middle of American political opinion. Hell, playing to the media may be the right move. Just as far as playing to the "center" goes, if it means playing to the majority of American opinion, then he has been moving to positions that are more conservative than the majority of American opinion. By the way, this defiantly won't be the last time we talk about this subject, and once I get a few spare moments to look up some poll numbers they'll be some more posts for sure.